If you can learn how to spot clean a stain on clothes, you can become a laundry hero and usually save the day. A good spot cleaner can save a coworker from an embarrassing moment as they head to a meeting and even avoid or delay a trip to the dry cleaner for an overall cleaning. Spot cleaning means treating only the part of the garment that has a stain on it. You must know how to use the right cleaning products for different types of stains and fabric and spot cleaning must be done correctly to prevent creating a bigger disaster. Spot cleaning is often done on intricate clothing such as a beaded dress. Since the dress has beading on it, spot cleaning can remove the stain without damaging the bead work. However, it will not work on all types of fabrics. Spot cleaning silk can often leave a "water mark" which looks almost as bad as the stain so heading to a professional is a better choice. Even when you plan to toss a garment in the washer, stains often require a spot treatment to make them disappear. 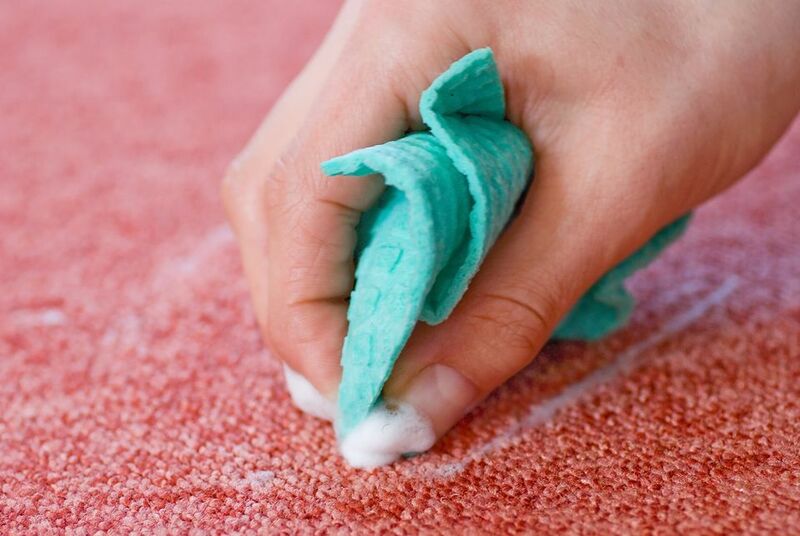 Sometimes referred to as "sponging", spot cleaning confines the stain to a small area and keeps it from spreading. It is important to follow the recommendations for removing specific types of stains. But, whether you are using a convenient stain removal pen at the office or working in a fully-stocked laundry room, follow these steps for best results when using whatever stain removal product that is suggested. Before you begin, use a spoon, dull kitchen knife or even the edge of a credit card to remove any excess stain matter — like a blob of gravy or butter — from the fabric. NEVER try to rub away the stain because you will just push the stain deeper into the fabric fibers. If the stain is all liquid, use a white towel or paper napkin to blot away as much moisture as possible. Keeping moving to a clean, dry area of the towel to prevent transferring the stain back onto the fabric. If you are in a pinch, a slice of white bread can be used to absorb oily stains. And, don't worry about finding sparkling water to dilute liquid stains. Plain water works just as well and is readily available. After removing any solids, grab a clean white cloth or paper towels. This will help absorb the stain and any cleaning product you are using and prevent it from spreading to other parts of the garment. Don't use a colored cloth or printed napkins because sometimes the color can bleed onto the stained garment and then you have a whole new problem. Place the stained area face-down over the white cloth. By working from the wrong side of the stain, you can force the stain into the white cloth and away from the garment. If you work from the front, the stain may just move deeper into the fabric. Dampen a small white cloth or cotton swab with the recommended cleaning product (water, stain remover, detergent, dry cleaning fluid). Use the dampened cloth or swab to pat the stain from the wrong side. Start at the edges of the stain working from the outside toward the center to keep the stained area from getting larger. As the stain transfers from the garment to the absorbent white padding, move the stain to a clean place on the padding so the stain has a clean place on which to transfer. Repeat the procedure until all traces of the stain are gone. Allow the dampened area to air dry. If you must rush the drying, avoid direct heat and choose a cool breeze from a fan. High heat can make any traces of the stain much harder to remove later. While spot cleaning can save the moment, eventually the garment should be thoroughly cleaned by washing or dry cleaning. Always follow the recommendations on the care label. Use a dull knife to remove any solid matter from the fibers. Do not rub the stain deeper in the fabric. Use a white cloth or paper towels to blot up as much moisture as possible. Follow stain removal tips for specific stains to avoid making the situation worse. Work from the edge of the stain toward the center to avoid spreading the stain. Use as little cleaning product and moisture as possible. Avoid direct heat when drying. Gentle air drying is almost always best.